Blend symphonic and other ''classical'' structures with his own brand of musical style... De hominis dignitate it''s an alternative expression romanian rock .Formed in Constantza in 2005 under name Caudillo,Marian Curteanu''s music is marked by sharp dynamic contrasts, extended song lengths, abstract expressions, and a general showcasing of instrumental prowess.He made his first radio appearance on Radio Sky Romania.The album ''De hominis dignitate ''feature complex classically influenced arrangements, unusual time signatures,subtile guitar interventions, dramatic, dynamic and metrical changes and oblique, . 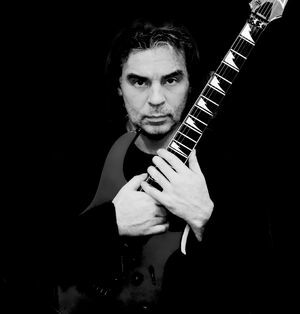 Songs often exceeded the standard three-minute pop-song structure with lengthy multi-part suites sometimes Pink Floyd influenced the artist as well as contemporary artists such as Dream Theater,Carl Jenkins,Mike Oldfield and olso classical composers such as J.S.Bach,Maurice Ravel.Marian Curteanu has a special atraction of musical experimentation . De hominis dignitate is an album associatied with the "psychedelic" influences and, therefore it''s difficult to classify. smooth alternative rock music with unextended guitar and keyboard solos consisting of classical music produced on guitars, organs, cellos, violins along with marching forms,who became an important part of the album''s sound. the album'' released in 2009, carries an abstract theme of absence of humanity and dignity within the everyday life.